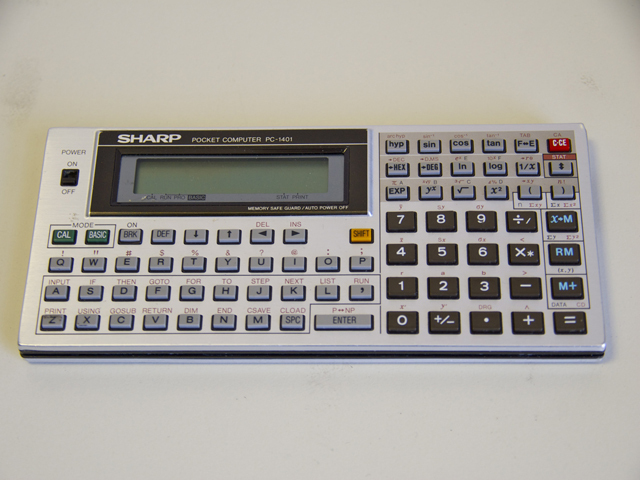 PC-1401 is the basis model of a very successful family of Basic programmable calculators. Its keyboard is conveniently divided into the calculator keyboard (right) and letters and special symbols (left). This allows to use PC-1401 immediately as a scientific calculator. The small display is not very convenient when programming in BASIC. In other aspects PC-1401 is as good as any other pocket computer and has similar not very convenient features, such as separate programming and execution modes. The keyboard of PC-1401 was preserved in the successors and became the basis for the keyboard of PC-E500.